You are the winner of the gift wrap kit giveaway! You should be on your way to wrapping your gifts in style very soon! Thanks to everyone who entered & stay tuned for more giveaways!!! The winner was chosen by random using random.org. Eversave: $5 Credit to new members & NATIONAL deal!! $5 in Save Rewards in your account to use towards any purchase on the site! Don't stall because as soon as 2011 rolls around, this will go back to $2!! CHIPOTLE: Purchase $25 Giftcard and get a FREE Burrito, Tacos, Salad or bowl!!! I went to Chipotle last night and purchased a $25 giftcard for my sister, the burrito-lover. With the receipt from that purchase I got a FREE choice of burrito, tacos salad, or bowl! I got the tacos ;-) YUM! 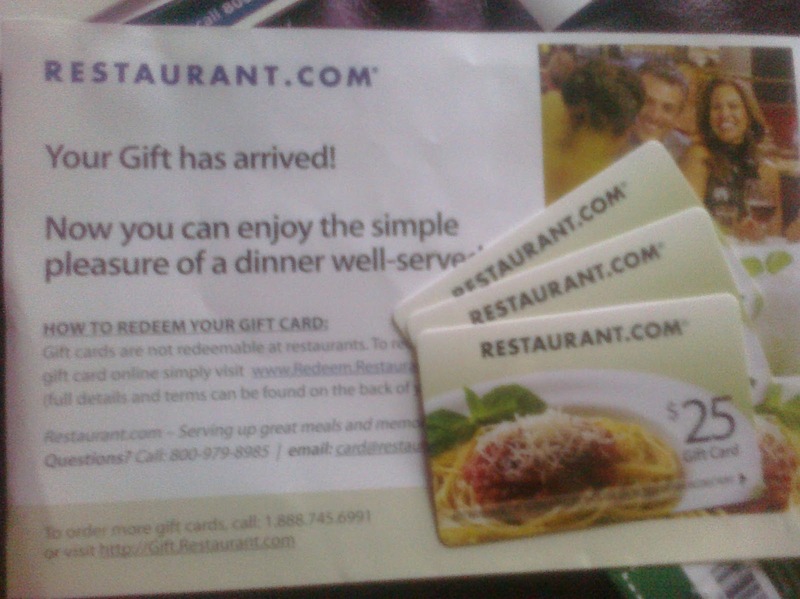 To get the most bang for your buck, this deal works in $25 increments so if you want to purchase a larger gift card I would advise separating it out and asking for separate receipts, so you can have a FREE meal with every $25! You may redeem your receipt at a later date as long as it's before 12/31! FREE Coffee from Borders & FREE 2oz. Lotion from Bath&Body Works!! Treat yourself to some freebies during that intense holiday shopping!! Bath & Body Works is offering a FREE 2 oz. Island Escape body lotion to their Facebook fans, just "Like" their page to get in on the action! Valid until Sunday 12/19! Swagbucks: Mega Swagbucks Day! Earn lots of Swag Bucks! Today is Mega Swagbucks day! You can earn extra Swagbucks today just by surfing the web! In addition to just surfing the web, you can also earn Swagbucks by taking part in polls, offers, surveys & more! It's up to you how involved you want to get! After you earn the required amount of Swag Bucks (this varies depending on what you want) then you can cash them in for prizes, gift cards & lots of other swag. Go here to read more about it. I have personally earned over $80 in Amazon gift cards (and that's almost entirely just for surfing), so I can say that this Swagbucks thing is the real deal! Still have questions about Swagbucks? Please ask! 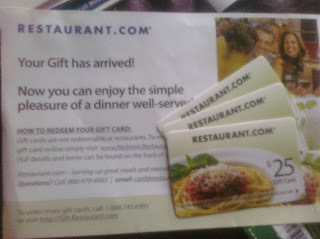 Restaurant.com: 80% off Gift Certificates (including NEW Gift Cards)! + 30% Cash Back! Restaurant.com has a new 80% off code starting today! Just use code PRESENT to get $25 certificates for only $2! Don't forget about the new Gift Cards they offer! I ordered a bunch last time they were on sale & they came delivered in the mail a few days after I placed my order! These are also just $2 after the 80% discount! Plus, go through Shop At Home first (search for "Restaurant.com") for 30% cash back! That makes the $25 certificates only $1.40! 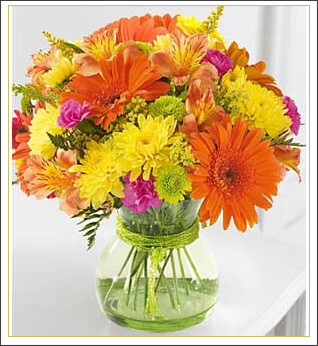 Eversave is offering a "save" today for $50 at Enchanted Florist for only $25! There's still time to place your holiday orders . . . you can order up until December 23! Although your "save" won't be valid until tomorrow if you purchase today. The voucher can be used toward shipping & doesn't expire until June 16, 2011! If you're new to Eversave you will get a $2 credit just for signing up! Geneva Silicone Band Watch (Lots of Colors!) only $7.98 SHIPPED at Daily Steals!!! Daily Steals has these Geneva silicon band watches for only $2.99 each! Shipping adds $4.99 . . . making the total only $7.98! Even with shipping, that's a low low price! 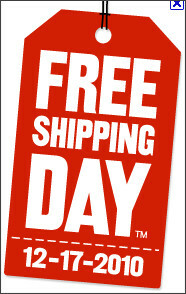 Just a heads up that tomorrow (December 17) is national FREE SHIPPING day!!! Over 1,300 retailers will be participating, so it's the perfect time to do some last-minute online shopping! If you aren't already signed up for Shop At Home and Ebates, you may want to sign up now! That way you'll be ready to earn cash back when you shop! Crunchy How-To: Make Your Holidays a Little "Greener"
There's no reason the holidays can't be a time of sustainability! Here are some tips, just small things, that can make a big difference. 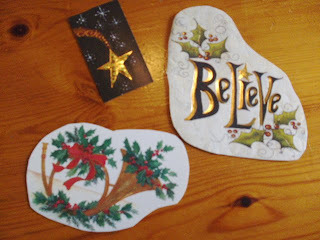 Make gift tags out of cut-down cards. You can be frugal AND green :-) Usually we have a whole stack of old Christmas cards and what a better way to give them a second life! I like to cut fun shapes out of whatever graphic is on the front, hole punch a corner and use them as gift tags. Buy and recycle non-metallic wrapping paper. Metallic wrapping paper is super fun and attractive but hard to recycle, instead chose paper products that can later be recycled! Decorate a tree for the birds. This is fun as a project for the kids too! Place seed bells, pine cones with peanut butter and seed trays on any tree in your yard, preferably in the open where cats can be seen easily by the birds. This offers an important food source for birds during the winter. Choose alternatives to commercial gift wrap! There are so many options which are cost-free, attractive solutions. Gift bags can be made using fabric scraps, or wrapping can be made using comic strips, old calendars, maps, posters and more! Have a couponing friend?? Wrap his/her gift in expired inserts for a good laugh!! All of these tips can easily be done and most give a creative twist to gift-giving, which is sure to be appreciated!! What are your "green" holiday tips?? Leave a comment and share!! 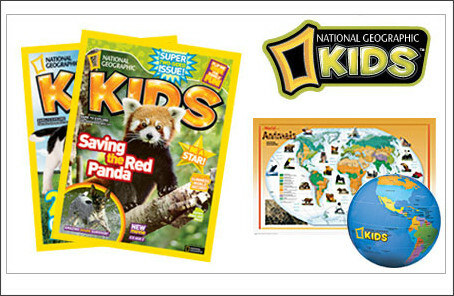 Plum District, a daily deal site, has a fantastic deal on National Geographic Kids today! For only $15 you get a year subscription (10 issues) to National Geographic Kids, an Animal World Map, and a World Beach Ball! The regular retail price is $49 . . . so that's a savings of 69%! New to Plum District? Sign up here! National Geographic Kids (only the magazine subscription) is priced at $19.95 at Amazon just for comparison . . . so this is an awesome deal! COUPON: Kraft Cheese with a Touch of Philly Coupon $ .50 off One! 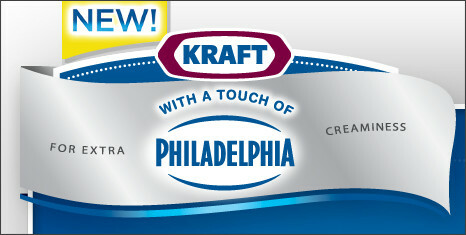 Go here to print your $ .50 off one Kraft Cheese with a Touch of Philly Coupon! Print now . . . I'm sure it won't last long! but they've stepped it up with 30% off! Even small items like wristlets, scarves, dog collars make great & thoughtful gifts! This Sunday, December 19th, there will be NO COUPONS in the paper! Dry your eyes . . . take a break . . . and get ready for lots of coupons in 2011! Today is Wednesday, and that means that Farm Fresh will double your coupons up to (& including) $1.00! Here are some great buys for today (Wednesday)! “Like” Gerber on Facebook to get 3 coupons! The $1.00 ones will double! $1.00 off any 3 (2-packs) of NatureSelect 2nd Foods! “Like” Coffee-Mate on Facebook to get a $1.00 off one product coupon! This should make some super cheap (or FREE!) Coffee-mate creamer once it doubles! Makes each one only $. 25! “Like” Jimmy Dean of Facebook and get $1.00 off any Jimmy Dean product coupon! 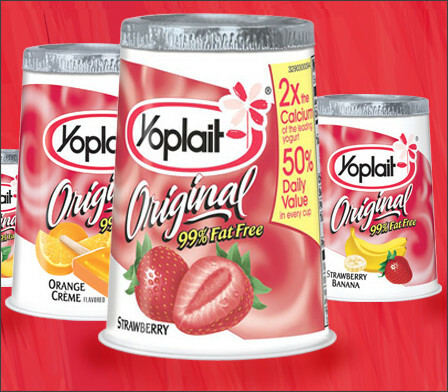 use the coupon which will double making it only $1.00 each! Please feel free to add anything I missed in the comment section! And you can also check out The Coupon Challenge who always does a fabulous job at match-ups! 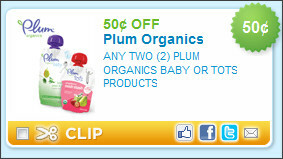 COUPON: Plum Organics $ .50 off 2 (2 different links)! Go here to print your Plum Organics $ .50 off 2 coupon! Be sure to look under the "Food" section to find it faster! Plus, you can go here and print out another coupon from their website! Go here to find them near you! They sell these at my local Target & my son happens to love these! 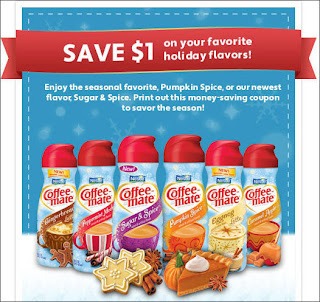 "Like" Coffee-mate on Facebook to get a coupon for $1.00 off any Coffee-mate! Their holiday flavors are yummy! Eversave National Online SAVINGS!! Handstand Kids Cookbooks!! Eversave is a collective buying group, similar to Groupon! They have great local deals as well as national deals that anyone from anywhere can save! TODAY they have a great deal from Handstand Kids where you'll received $32 worth of cookbooks and gear for your littlest chef for just $16 !!! Head on over here to request your FREE Yoplait yogurt cup! Here's a high value coupon! Go here to print your $1.50 off ANY Wholly product coupon! This includes the guac, salsa, or queso! Just in time for entertaining during the holidays . . . because parties aren't complete without chips & salsa, right?! Angel Tree Gift . . . How I Made My Dollars Stretch So I Could Buy More! I picked up an Angel off the Tree. It was my goal to see how much I could get this 4th grade boy while I watched my budget at the same time! 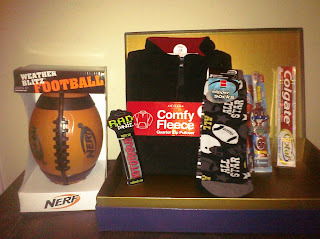 I got this fleece zip up and 2 pack of slipper socks at JC Penney using the $10 off $10 coupon . . . my total was only $3.13! The toothpaste was in my stash and was a FREEBIE! The Spiderman Spinbrush was a deal at Walgreen's last week and turned out to be about $2! The Nerf football came from Ollie's Bargain Outlet (there's a regional coupon for 20% off a toy in the paper not sure of the date/insert!) . . . after the coupon it was only $5.99! Right now I am at about $11. I am not completely done with the whole package yet (I'll throw in some other freebies, like candy and such and I will also pick up something educational! ), but I just wanted to give you an idea of how you can do some good in this world and still stick to a budget! How do you "do good" while watching your dollars? Do you donate your time? Do you donate other items? Please share some ideas! Would you believe it if I told you that I got more back than I paid with this Rite Aid deal?! Here's the breakdown . . . So, I used . 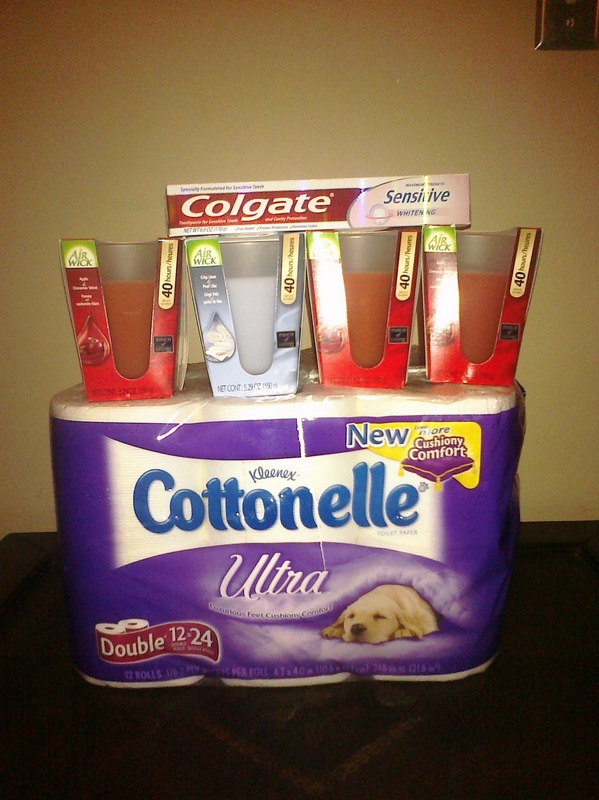 . .
4 Airwick coupons (the ones form 11/14 Smart Source (SS) are $3.00 off one, and the ones from here are $2.00 off one) I used 2 of each and they were on sale Buy One Get One Free! and I also had some leftover +UP Rewards . . . making my total $5.68 (including tax) . 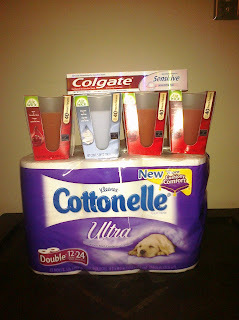 . . and I got $6.50 +UP rewards back ($3 +UP for buying $10 worth of Airwick products & $3.50 +UP for the toothpaste)!!! Plus, this is going to help me reach the next level in the Gift of Savings program! GIVEAWAY: Gift Wrap Package (Everything You Need to Wrap Your Gifts)!!! 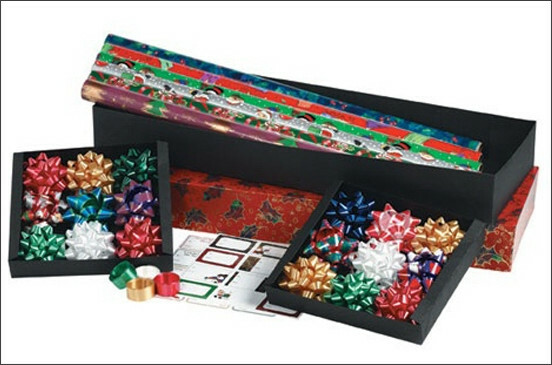 This gift wrap package will help you have the best looking presents underneath the Christmas tree! It includes 6 rolls of gift wrap, 18 bows, gift tags, tissue paper and ribbon! Similar kits retail for $25! This giveaway will be short & sweet! It will end this Friday, December 17. Fill out the form below for your chance to WIN! *be sure to let us know in the comment section if you do any/all of the extra entries! The Fine Details: A very special thanks goes to one of Santa's elves who graciously donated this giveaway (he wishes to remain anonymous for obvious reasons!)! Thank you & we're sure you're on Santa's Naughty Nice list this year! This giveaway will close on December 17,2010. This is not a paid post. The winner must have a US mailing address. The winner will be chosen by random using random.org and contacted by email. If no response within 24 hours, then another winner will be chosen--this has to get in the mail in time! TARGET DEAL on Glade Holiday Products! FREE Gift Card!! 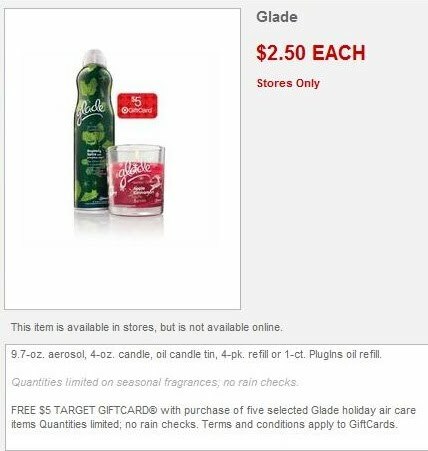 Use $1/2 Glade Jar Candles, 4 oz. You'll get a $5 Target Gift Card!! This is great to stock up on scents for your home - Always gets me into the holiday spirit! 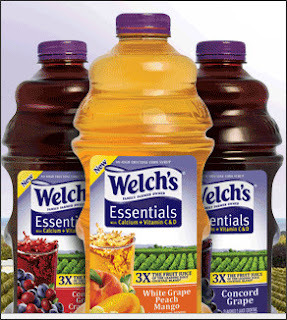 Head on over here to get a FREE bottle of Welch's Essentials! I requested this FREEBIE before . . . got the coupon . . . drank the yummy juice . . . and now it looks like I can request it again! Yippee! 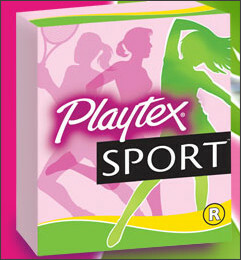 Go here to request your FREE Tampax Sport sample pack! If you are cheese connoisseur, then you will be absolutely thrilled about this FREEBIE! 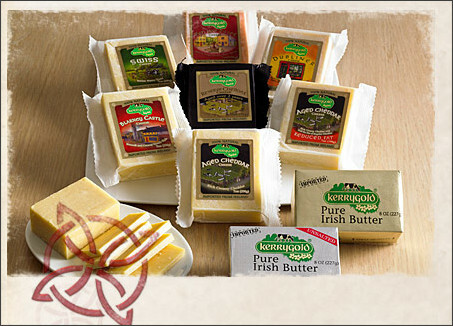 Head on over here to complete a survey on Kerrygold cheese (and butter), then print your coupon for a FREE product! Just in time to serve your guests at your holiday party! Through today only, Groupon is offering 3 Redbox movie rentals for the low low price of $1. That makes each movie rental a tiny .33 cents! Sign in or sign up for Groupon . . . look under "Cedar Rapids/Iowa City" and you will see this deal. It is a nationwide deal and not just in Cedar Rapids/Iowa City! 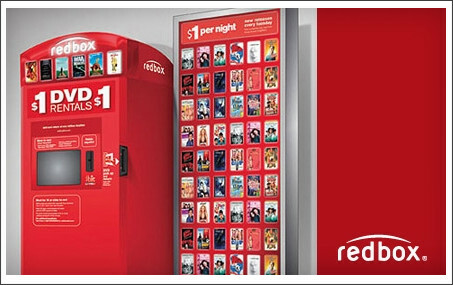 I love Redbox and use it all the time! Look for a location near you!